Encouraging Students to Attend School Everyday! Our Star Attendance Award for the Month of January goes to Ms. Martin's Class! Nationally, an estimated 5 million to 7.5 million students are chronically absent each year, eroding student performance as early as kindergarten. That’s at least one in 10 students. In some communities, one in four students is missing that much school. These absences have consequences, research shows. By third grade, chronically absent students are less likely to read on grade level. By sixth grade, chronic absence becomes an early warning sign that a student may drop out of high school. By ninth grade, it’s a better indicator than eighth-grade test scores. Children with certain risk factors—including poverty, homelessness, frequent moves and chronic illness—are especially hard hit since they can least afford to miss school. •Chronic absence is often higher among children with disabilities. This requires examining the nature of the disability and how well the educational needs of these children are being met. 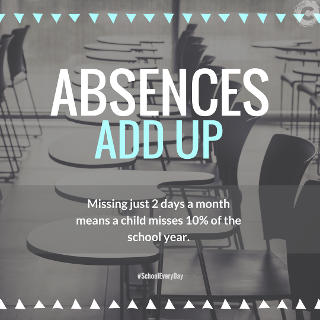 In school districts where state aid is determined by average daily attendance, chronic absence costs schools millions of dollars each year. Too many schools and districts have no idea how big the problem is because they don’t track how many students are missing so much school—for any reason, whether excused or unexcused—that they are at academic risk. 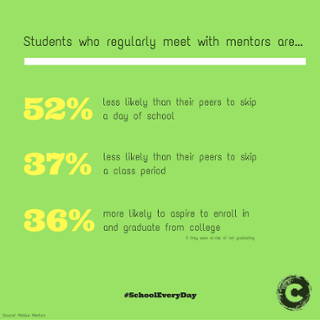 Instead these schools and districts look at average daily attendance (the percentage of students who typically show up every day) or at truancy, which generally includes only unexcused absences. Schools, families and communities can work together to turn around absenteeism and build a culture of attendance in every school. 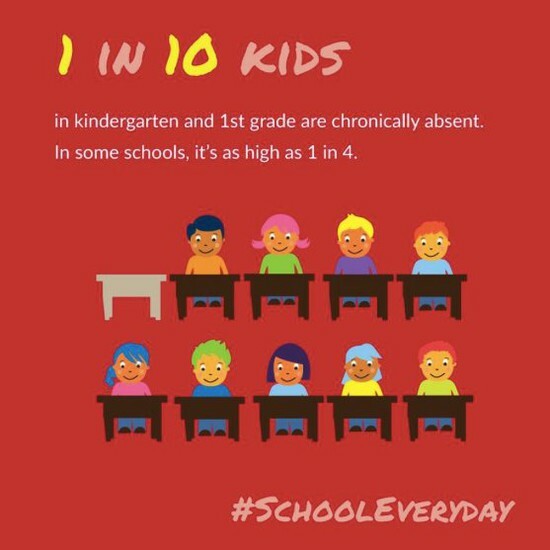 Successful efforts start with educating students and families that regular attendance, from a child’s first day in school, is essential to long-term academic success. Positive approaches include incentives and recognition for students and schools where attendance improves. Closer attention needs to be paid to data to identify when students are missing too much school. 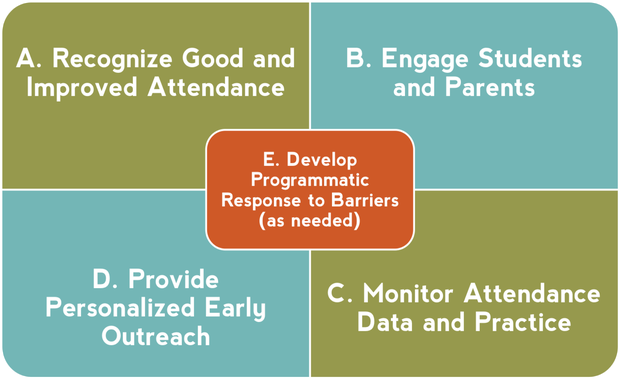 Data is essential to triggering early outreach, support and intervention for at-risk students. It can also identify schools with an unusually large number of chronically absent students and the ”bright spots,” such as schools with good attendance despite challenging conditions. These positive outliers can help inspire and teach others effective strategies for improving attendance. 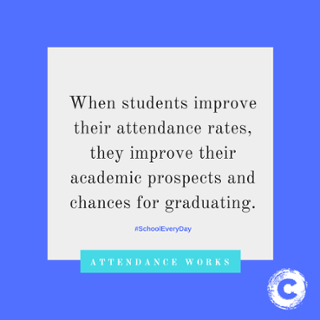 A common characteristic of these schools is a comprehensive approach to turning around attendance that begins with positive supports. Starting with prevention is more effective and less costly than punitive efforts involving fines and court appearances. Legal action should always be the last resort. Based on the Ad Council’s research with parents, we know that how we talk about attendance matters. All parents care about their children’s success in life. But they often do not realize how quickly absences can add up to academic trouble. For example, many parents don’t see absences as a problem if they are excused or if they are not on consecutive days. Parents also don’t always make the connection between attendance in elementary and middle school and eventual graduation from high school. The message we must deliver, backed up by research, is that every absence matters at every grade level. Every day missed is a day of instruction missed, a day of classroom interaction with students and teachers that can’t be recovered. A critical intervention can be ensuring that parents know exactly how many days of school their child has missed and at what point too many absences become problematic. While it is important to send a message throughout the year, the start of the school year is crucial because that is when schools and communities lay out expectations for the coming year and can develop a culture of attendance that will continue throughout the year. Many principals hold rallies or assemblies, which are perfect opportunities to share this message with students, parents, and staff. 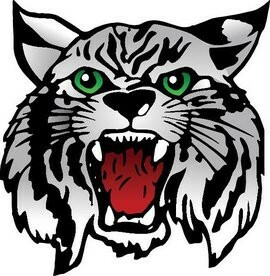 School officials are often interviewed by the media at this time, which is another chance to spread this message to the entire community. 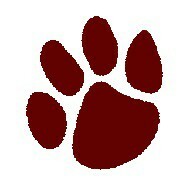 September is also the right time to establish a baseline for attendance data, to measure improvement in the year ahead. We recommend looking at chronic absence numbers, an easy task for districts with automated attendance systems. This allows schools to identify individual students, as well as trends in absenteeism. Average daily attendance figures, which most schools already report, can also provide clues to where problems lie.